The ultimate helmet for the most demanding applications. Both the helmet shell and lens meet ANSI Z87.1-2003 [High Impact] standard. Suitable for most welding applications, the lens starts working when it senses a welding arc. Shades 9-13. The mode to use for Plasma, laser, gas welding and cutting applications, the lens starts working when it senses a cutting arc. Shades 5-9. Used for metal grinding applications. The Shade is fixed Shade #3. No lens adjustments are required. 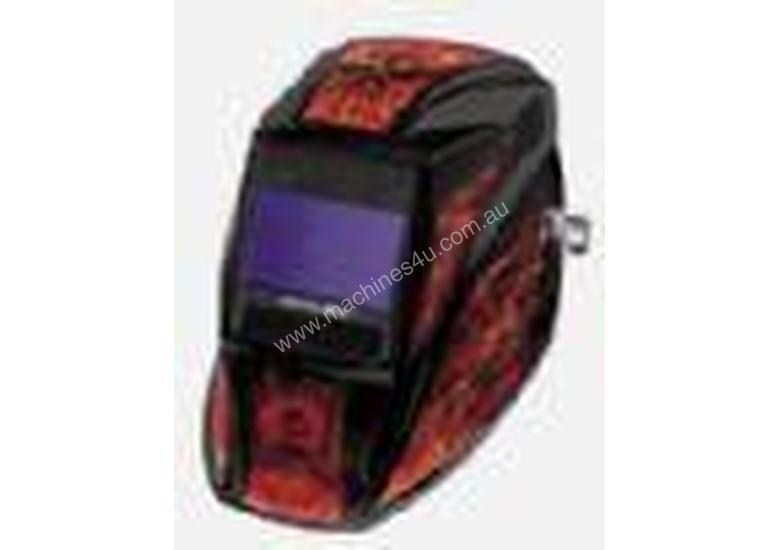 Used for outdoor or low current welding, the lens starts working when it senses weld current. X-mode uses electromagnetic arc sensing technology to eliminate sunlight interference and obstructed sensors. Shades 9-13. 30% larger viewing area than our standard lens for maximum viewing capacity. Lens technology responds to extremely low-amperage TIG arcs(5 amps and below) including DC inverter TIG. Comfortable fully adjustable ratchet style headgear with odour absorbing headband and comfort cushion. Four independent arc sensors provide continuous arc-sensing capability for your most demanding applications - highly recommended for low amperage TIG! Lens darkening reaction time is 1/20,000 sec. 17% lighter than most competitive models. Extra cover lenses, helmet bag and comfort cushion included.